Since the publication of Decomposer Basidiomycetes, their Biology and Ecology (Frankland et al., 1982), which barely touched on interspecific interactions, considerable research effort has gone into understanding the fungal-fungal interactions that occur during the development of communities in soils and in plant litter. 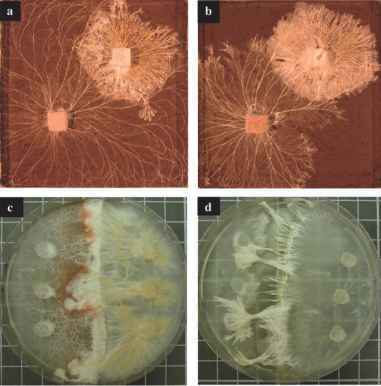 A critical distinction has been made between fungi with primary as opposed to secondary resource capture strategies (Rayner and Boddy, 1988). The former establish in a resource in the absence of competitors, whereas in the latter organisms already present in the resource are replaced. Complete absence of fungi occurs rarely if at all, as fungi are latently present in functional tissues, though in freshly felled wood, for example, their mycelia have not had time to develop extensively and the resource can be considered 'uncolonized' (Chapter 11). In natural ecosystems, resources free of microorganisms are probably rare; in the absence of human interventions, uncolonized woody resources may become available when branches break or trees fall during storms, or following animal damage to trees. In contrast, thinning and clear felling operations in managed forests suddenly expose large quantities of woody resource to colonization, favouring fungi with primary resource capture strategies. The ability of the interacting fungi to capture and defend territory in resources is achieved through either antagonistic combative mechanisms (e.g. Dowson et al., 1988; Boddy, 2000; Donnelly and Boddy, 2001) or non-selective replacement (Holmer and Stenlid, 1993). Such interactions and replacements result in changes in communities over time (Rayner and Boddy, 1988; Boddy, 2001; Chapter 11). This chapter reviews the significance, mechanisms and approaches to studying interspecific mycelial interactions.